I love rings. I wear a lot of them. I make a lot of them. But I have also got to say that they can be tricky to size! Hands come in all different sizes, and size can change over time. For getting an accurate ring size, I recommend getting sized by a professional jeweler or at a jewelry shop. I also recommend getting sized a few times (if possible) since in the winter when it’s cold, your rings might fit differently than in the middle of summer when it’s really hot outside. I bring ring sizers with me to most pop ups, fairs and trunk shows that I do, and am always happy to help you find your ring size. You’ll probably find that most jewelers will bring sizers with them to events, and most stores that sell rings can help you find your ring size. I’ve found that often sizes differ from the left to right as well. I’m right handed, and the ring sizes on my right hand are all about a 1/4 to a 1/2 size bigger on my right hand than on my left. I do not recommend trying to measure your finger with a piece of string. It will most likely be more bother than it is help. String doesn’t have the same shape or rigidity as a ring. If you’re off by a millimeter that can have a real effect on how the ring will fit you. If you can’t get to a jewelry shop or find a local jeweler to help size you, I have ring sizers available in the shop, for $5 but they ship with a coupon for $5 off any ring in the shop. The ring sizers are roughly the width of a 3mm band. If you’re getting a wide band, like 6mm or 12mm you may want to size up a little, and likewise if you’re getting a skinnier band, like 1mm, you may want to size down just slightly. For example, in a 1mm band, I wear a 6, in a 6mm band I wear a 6.5, and in a 12mm band, I wear a size 7. Most of the rings that I make can be made in US whole and half sizes 4-12. I don’t always have all of those size options available for every style, but often I can make it as a special order. So if you don't see your size, drop me a note. I’m also happy to make rings in quarter sizes. I wish that there was a standard to ring sizing. But unfortunately there isn’t. I make all my rings in US sizes, so for international ring sizes - please see this ring size chart. If you have any other ring sizing questions, feel free to leave your questions in a comment below and I’ll add them to this post! For each collection I usually choose one theme, a place that inspires me, a book that I’m channeling or something along those lines. This time I have two: New Mexico (my new home) and Storms (all kinds). I’ve been thinking a lot about the sun and the landscape in New Mexico, so you’ll see some shapes and names that reference these. I’ve also reworked and added some new variations on old styles, including two new versions of the Mitla ring, a new Georgia style with a rose cut diamond and turquoise, Hyalite Diamond rings, and St. Margaret’s Diamond Drop studs and necklace. I put together two new storylines that share a bit more about the inspirations behind the pieces. Read more about New Mexico and Storms. And see the lookbook in it’s entirety here. Most years begin the same. Early January tends to be quiet. I try to take it slow. 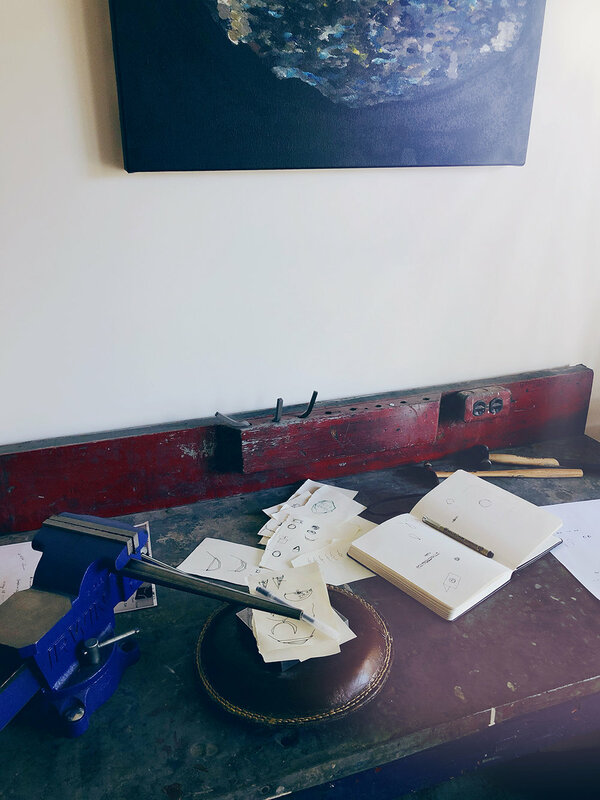 I always try to design a new jewelry collection in January, so I try to carve out a lot of time for sketching, making, finishing and photography. It’s also when I need to do my year end accounting, inventory, paying estimated taxes and all the other endless paperwork that builds up when you are self-employed. So I try to break up the days between the boring bits like taking inventory and the fun part of making new things and experimenting. And in between the paper work, I usually try to clean the studio so that I have a fresh start. Last week, as I was going through old papers to see what I needed to keep, I found a bunch of old sketches from past years (pictured above and below). It was really fun to see them, and I tore them out of the old notebook they were in so I could keep them around a bit longer. Some of the sketches turned into things and some just stayed drawings. I put together 2-3 collections of new jewelry a year. Generally, I get them ready to release in February and August, with some extras in the middle to keep it interesting. Once the newest collection is together, I start thinking about the new one. Pretty much immediately. Sometimes there are thoughts that don’t quite get finished that linger around and wait till next time. I keep a box filled with odds and ends that I’ve found in random places on my bookshelf, and every now and again I sort through it and think about shapes and textures. Often, when I’m working throughout the year, I’ll keep a sketchbook nearby and draw shapes as I’m thinking about them. After the holiday rush, and a little break, I pull the sketches out in January and try to add to to them, and piece together a collection. Once I have a few sketches that I want to make real, I’ll switch over into metal and see if I still like them. Unless I’m sure of a style, I always make it in silver first, as fabricating in gold can get insanely expensive, and putting together a new collection is already a huge investment. For now, back to the drawing board and the jewelry bench. Last month, when my mom was in town, we went to Abiquiu for the weekend. Abiquiu is about an hour’s drive from Santa Fe, and is home to Ghost Ranch and Plaza Blanca. We’ve been a number of times for day trips, and wanted to stay a bit longer to show my mom around. I found a cute little house on airbnb with room for three, which proved to be a perfect spot for us for a quick getaway. If you’re curious, we stayed here. We’ve driven through Abiquiu a lot, going for hikes and driving through the town. One thing I’ve always found fascinating is that it feels like you can see for miles and miles, but you rarely see houses from the road. On many occasions, I’ve turned to Sonia and asked where everyone lives. With each time we’ve visited, we’ve seen a new part of the town, or driven down a road we’ve never gone on before, and each time we’ve seen a few more houses. It is a very small town, and houses do tend to be spread out. Often they are off of dirt roads that you don’t see unless you’re looking for them. This was definitely the case with the place we were staying at. Thankfully it wasn’t too far down a dirt road, as we don’t have four wheel drive on our car. When we arrived, there were two husky puppies there to greet us, who we fell in love with. Abiquiu is a very small town, and places to eat out are limited, so we decided to bring our own food to cook for the weekend. This suited us just fine, since we love cooking. We packed warm clothes, lots of food, good books and Scrabble. Our first night was lovely, very peaceful. Mom and Sonia tried and failed to beat me in Scrabble. (Don’t worry, Sonia’s parents came into town a few weeks later and totally crushed my game.) In the morning, we woke up to snow. Sonia and I had planned to go for a run, so we put on extra layers and headed out. It was beautiful and quiet out in the snow. We moved to New Mexico at the end of December last year, and there was hardly any snow the entire winter. Coming from Chicago, I didn’t miss it that much last year. But this year, I find that I’m really excited to see what New Mexico looks like under a white blanket. After our run, we warmed up in our little house and had breakfast with my mom. We decided to go for a drive and a short hike to show my mom around. First we drove through the village of Abiquiu, and stopped in at Bosshard Gallery to look around. They have this lovely old truck parked out front, and the gallery itself was housed in a beautifully restored old building. We had fun looking around, and getting out of the cold. We stopped in at Bode’s, because no trip to Abiquiu is complete without a visit there. And from there made our way out to Ghost Ranch. When we pulled into the visitor’s center, the snow had stopped and the sun was peeking out of the clouds in fits and spurts. We decided to try the short trail up to Chimney Rock. Mom, enjoying the snow and the view! We didn’t quite finish the whole Chimney Rock hike because the snow was a bit too deep, but we were rewarded with lots of wonderful views. To be honest the view on our entire walk was utterly amazing. The sky is so big and dramatic, and it was changing every minute. We could see snow showers far away, and then the sun would come out in just one little corner of the sky and spotlight some beautiful rock formations. The whole day was magical, we were truly in a winter wonderland. After we got back to the car, we decided to drive around Abiquiu Lake to show my mom the view from the other side. By the time we got there, the storm was rapidly moving away, and the skies had mostly cleared, leaving just a few patches of snow. And once we got back to our little weekend house, the snow was already melted almost everywhere. As if it had never happened. After dinner and our scrabble games both evenings, we each moved onto our beds with a book. I brought Gretel Ehrlich’s book The Solace of Open Spaces with me. I’d just finished her book A Match to the Heart and loved it. (More on that and other favorite books here.) The Solace of Open Spaces is her first book, about moving out to Wyoming, and it was the perfect book to be reading out in the quiet of Abiquiu. New Mexico winters aren’t quite as harsh as Wyoming, but there is a lot of wide open space and sagebrush in both states, and there are lot of similar feelings to the landscape. I finished it back in Santa Fe, but I’ll always remember reading it in the plant and light filled loft at the Raven House. I snapped this picture because the morning light was just so good in the loft. But this tableau is frequently what you will find on my night table anywhere, traveling or otherwise, a good book (currently that book is The Witch Elm by Tana French), notebook, and jewelry from the day before. The jewelry tends to be the same, I basically wear these pieces most days: the Thin Pontchartrain and Fuller bangles, the Mavericks Hammered cuff, the Carson ring, the Fuller ring, the Hyalite Small necklace, my wedding rings, the Small Hera earrings and Opal studs (not pictured because I rarely take my earrings off). The whole weekend was quite magical, and I’m glad that we got to share it with my mom. I miss it already so I’m scheming some writing retreat weekends away with Sonia in Abiquiu and Taos for the next few months. With the holidays around the corner, I thought I’d put together a roundup of some of my favorite pieces this Fall, all of which are available in the Ready to Ship section of the shop and ship in 1-3 days. So there’s still time for them to arrive for the holidays! The Rope Cloudbreak necklace, 4mm Granite Band and 2mm Diamond Rope rings in 14k yellow gold. The Circe Sapphire necklace, the Small Circe Diamond necklace, the Small Hyalite necklace, and the Mavericks Diamond Trio necklace. Small Circe Diamond earrings in 14k yellow gold (pictured with rubies). Pontchartrain Thin and Pontchartrain Extra Thin bangles with the Wave Cuff in sterling silver and 14k yellow gold. The Georgia Sapphire and Opal ring and the Terence White Diamond ring. Pictured here with the 4mm Breakwater ring. The Hera earrings in 14k yellow gold, Diamond Teton studs in 14k yellow gold and the Large Em studs in sterling silver. Check out the rest of the in stock styles in the Ready to Ship shop. If there is something that you are looking for that isn’t in the Ready to Ship shop, get in touch to inquire about a rush order. Each piece of jewelry ships with a muslin jewelry bag and a black jewelry box wrapped with baker’s twine so they are ready for gifting. If you’d like a gift card to be included, just leave a gift note at checkout and we’ll get it all ready for you! P.S. I’m doing a pop up shop in Brooklyn til the end of December at the Better Shop, and they have a great selection (including some of these styles). If you’re in Santa Fe, Cupcake Clothing has an extensive selection of my work, and they are open until Christmas! Someone asked me recently if I had any recommendations for books, classes or schools that would be helpful for someone getting started making jewelry, so I thought I’d write up a post with some of my favorites! And it was a good excuse to snap some quick photos of the new studio. I absolutely did not photograph the messy side that I haven’t finished unpacking yet… So more on that soon. But for now - here is a bit about how I got started making jewelry, and some recommendations for classes + books that have helped along the way. Also, check out my interviews with Shana Ready of The Ropes, Polly Wales + Gretchen Jones for more tips on getting started as a designer. my beat up work table in the new studio! I found the table on craiglist, it had been used in an old garage for years. If you’re interested in making jewelry, I definitely recommend taking a class. Most community colleges and community art centers offer some kind of jewelry course. It’s worth it to take one or several. In person instruction is really crucial for getting started, especially when it comes to learning how to safely operate torches and work with hand and rotary tools. Once you have a lot of the basics down, online tutorials and books can come in handy as supplemental resources. There are countless videos on YouTube on a variety of topics, and I’ve definitely utilized some of them when trying to learn new techniques. I started making jewelry as a kid, mostly of the fiber, beaded, and fimo clay variety, and loved it! (My mom still has some ancient fimo creations somewhere to prove it.) When I got to high school there was a jewelry making class, and it was then I started learning how to form metal. I also took a few classes at the nearby Heartwood College of Art, and then my high school art teacher set up an apprenticeship for me with local jewelry designers. I got high school credit during the school year, and then helped them out in the shop for a few summers. Through classes and the apprenticeship, I got tons of hands on experience, and became really comfortable with all of the tools and torches. I left Maine to go to art school at the School of the Art Institute of Chicago. Once I got there, I found that I really wanted to learn how to use new materials and work on a much larger scale, so I focused on sculpture and ceramics. Also, the jewelry and light metals department at SAIC was all but nonexistent. So, after the first year, I brought my all of my jewelry tools out to Chicago, and continued to make small pieces for myself and friends at home. After school finished up, I moved to Philadelphia, I worked briefly as a bench jewelry for a large jewelry company there. They taught me how to work with gold, as all of their pieces were primarily 18k gold and pave. The shop was very impressive – I got to see a laser welder in action for the first time, and they had separate, well-venhilated room for polishing. I didn’t stay there for very long (I moved back to Chicago), but it was exciting to see and work in a really well-laid out workshop. Back in Chicago, I worked for another jewelry designer for a number of years. I learned invaluable business experience from that position and saw first hand the ups and downs of running your own business. I had done a lot of larger, sculptural casting in art school, but I’d never done any jewelry casting, so I signed up for a casting class at Lillstreet Art Center in Chicago so that I could learn how to carve my own waxes. They have a great metals department and I recommend starting with any of their jewelry classes. They also have shared studio spaces – and I had a space there for a while. It’s a great space to work in if you’re just getting started. Most shared studio spaces are, since jewelry tools are so expensive, and you need so many different kind. It can be really helpful to be part of a shared space while you build up your own tool collection. my wooden tool box, where I keep hammers and mandrels, in the new studio. Found the tool box at the Savers in ABQ, and the other tools have mostly all come from Rio Grande over the years. Here in New Mexico, there are also a lot of resources for metalsmiths. At Rio Grande in Albuquerque, you can take metalsmithing classes of all kinds. They are also a great supplier for students and jewelers alike. You can get a student account with them and don’t need a business license or tax id number to buy from them, as is the case with a lot of jewelry suppliers who only work with other businesses. I haven’t taken classes with them, but I’ve been getting supplies and tools from them since I was a teenager. Another resource is Meltdown Studio, which has locations in Albuquerque and in Santa Fe. They offer light metals classes and bench rentals. And even Georgia O’Keefe’s Ghost Ranch out in Abiqui offers seasonal jewelry making workshops. The jewelry designers that I apprenticed with in high school gave me a copy of Tim McCreight’s The Complete Metalsmith which I still have and use today. It’s a great intro to metalsmithing, with lots of great information about tools, soldering and forming techniques, stone setting tips, and lots of useful charts in the back. While I don’t look through the book as much for help with technique and tools references, there are a bunch of helpful conversion charts in the back that I find myself referencing often. Hands down, it’s my most-used jewelry book. As a teenager, I spent a lot of time in the section on stones, reading about the different properties of each stone, learning their hardness and the superstitions behind them! Beryl, hardness 7.5-8, This stone occurs in a wide color range including pink, orange, yellow, green, blue-green, and blue. It is also found colorless. This resembles rock crystal and was used for lenses and crystal balls. Pink Beryl is known as morganite, after the banker and gem collector J.P. Morgan. This stone is said to protect the wearer from helplessness caused by fascination. It was also used to treat diseases of the eye, jaundice and liver disease. Diamond, hardness 10, From the Greek “adamas,” unbreakable, indomitable. Diamonds were believed to render all poisons harmless and to drive away madness, night spirits and evil dreams. Moonstone, hardness 6-6.5, A feldspar of orthoclase with thin layers of albite. This yields a play of light called adularescence as light is spread by the fine particles or layers. The effect is a cool frosty glow that accounts for the name of this gem. Occurs in white, gray, pink, green, blue, chocolate, and an almost clear variety that looks like a water droplet. When work around the neck, moonstone protects against epilepsy and sunstroke. It is used to treat headaches and nosebleeds. When hung on fruit trees it produces abundant crops and generally assists all vegetation. McCreight used to teach at Maine College of Art, and has a number of other books that are really interesting. I find his book on boxes and lockets really interesting, and his casting book very helpful. Somewhere, I stumbled upon Anastasia Young’s books, and have referenced them a lot in recent years. Her Workbench Guide to Jewelry Techniques is a great compendium of different ways of working with metal, and her book Gemstone Settings is a really helpful guide to setting different types of stones in all shapes and sizes. Also the photos of some of the jewelry in the books are just so fun to look at! I also recommend checking out Anastasia Young’s own work – her pieces are so beautiful and interesting! She’s based in London and currently teaches jewelry making courses at Morley College and Central St. Martins. Another fairly recent addition to my jewelry book library is a helpful business focused guide by Emilie Shapiro called How to Create Your Own Jewelry Line (she also has a book on wax carving). She talks about how to start a business, think about design, source materials, handle marketing and finance, and lots more. By the time it came out, I’d already learned a lot about the business from working in jewelry for many years, and from starting my own company, but there were still lots of really useful things in the book for me. For instance tips on creating master production forms and spec sheets were really helpful organizing ideas. I also really hate cutting the white background out of product photos, and she lists a few places online where you can outsource this, so I totally went for it, and it’s really made getting a new collection ready for release much easier. So thanks Emilie! Also be sure to check out her jewelry as well - it’s super cool! Gretchen Jones Shares Tips for Emerging Designers - my interview from with Gretchen Jones about getting started, also be sure to check out what she’s doing now on her website and instagram. 3 Tips to Succeed in Jewelry Design from Shana Ready of The Ropes - my interview with Shana Ready (from my hometown!!!) about her jewelry line, and career. Polly Wales Rings Master Artful Elegance - my interview with Polly Wales about her jewelry designs and background in sculpture. 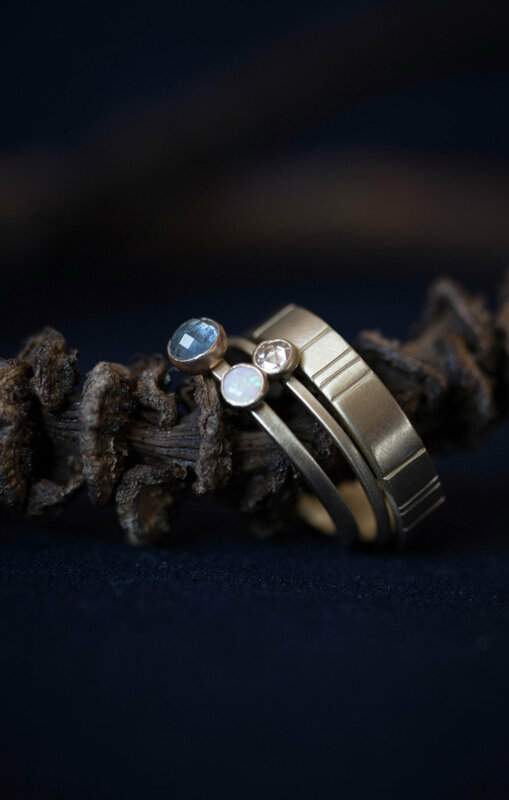 The Ethical Metalsmiths - great organization of jewelers committed to social and environmental responsibility. P.S. thanks to Tim McCreight, Anastasia Young, Pam Robinson, Sarah McGuire, Deborah Robinson, Judith and Elizabeth Gilday and all the other teachers I’ve had along the way! Most of the year I spend my work days inside the studio by myself. I hammer, file, drill, polish, and sand away sterling silver and gold, turning them into various shapes, while listening to audio books and podcasts on my phone. Most of my connections with customers tends to be over email, with some occasional meetings in the studio. So every year I try to plan for a few fairs or events where I can get some face to face time and actually get to meet some of the folks that I get to make jewelry for. Back in Chicago, I used to table at Dose Market and Renegade Craft, and it was always nice to see some familiar faces, as well as meet other local vendors. Now that I’m in Santa Fe, I’ve been wanting to try out some events a bit closer to home. So last week, Sonia and I drove up to Denver to try out the Renegade Craft Fair there, and to see a bit of the city. Denver is about a six hour drive from Santa Fe, so we headed up the day before. We pulled in, dropped off our stuff at our Airbnb, and headed downtown to Sonia’s favorite Denver restaurant City, O’City. They have really great cocktails and a vegan + vegetarian focused menu, so it was very Sonia friendly (she’s gluten-free and vegetarian, so we’re always looking for places with good GF options). The fair was at the EXDO event center, but outdoors, so when we arrived at 8:30 am everyone was pitching their tents and wheeling their wares into the parking lot. Denver felt a lot like Santa Fe, chilly air in the mornings, but it turned out to be a scorcher of a weekend. Sonia is the best, and I am the luckiest because she likes to help me out at the fair! I had planned out the booth layout ahead of time, but had no idea what to expect from the weather. I’m used to Chicago-elevation outdoor fairs, so I was unprepared for the intense sun side effects of doing an outdoor fair in Denver (the mile high city). I rearranged the booth all day, moving the tables away from the sun as it moved throughout the day. The thing about jewelry in the sun is that it just gets too damn hot. I had to offer up hot jewelry warnings to anyone that went to touch any piece that had been near the sun. This turned out to be the best layout for a corner booth at the fair, with least sun at all times of day on the jewelry and books. And as it turns out the books get hot too! The fair overall was pretty quiet, nothing like the outdoor Renegade market in Chicago, which covers numerous city blocks every September. However, I did get to meet a lot of folks, customers and other vendors alike. And I even spotted a few stud earrings in action! I like using displays that already have a place in my home and studio, so I tend to bring a lot of books and rocks with me. I also really enjoy painting, so I’ve been making a handful of painted denim and linen pieces that I use at events, and also around the house. I’m planning to make more of these, but I’m waiting on a bigger studio space (coming soon!). Also, I just love the contrast of metal on painted fabric…. SHE IS RESTLESS books, all lined up. If you have any favorite handmade markets or fairs that you like in the West and beyond, let me know! I’d love to try out some new ones. And if you’re in Santa Fe next month, I’m having a trunk show at Cupcake Clothing at 322 Montezuma Ave on October 18 + 19th.